Stay put for brunch time celebrations. 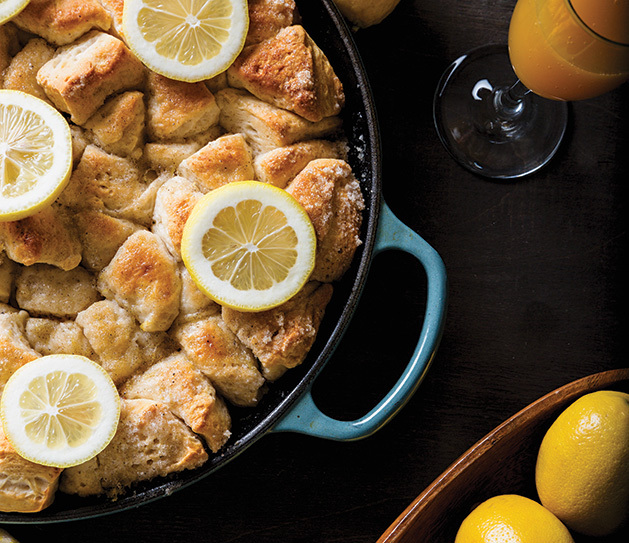 Spring celebrations often revolve around brunch. Something about the pastels of flowers blooming and trees budding makes us want to get up and head to some restaurant where $10 O.J.-heavy mimosas are followed by heaps of barely-cooked bacon and eggs that have been cooling their heels under a warmer well past their prime. Not to mention, your kids really don’t want to sit still for an hour and a half while you and the other adults chat, sip, chat. And repeat. So, don’t do it! Take the brunch celebration home, and make a meal that will impress (and really isn’t that hard). But if you’re sick of homemade egg bakes (us, too), we talked to the duo over at With Two Spoons, Lane Patten and Holly Berg, who offered up some brunch recipes to try at home. In a large cast iron skillet, gently melt one tablespoon of butter, and swirl to coat the pan. Cut each biscuit into quarters, and set aside. In a small bowl, combine 1/2 cup sugar, the zest of one lemon and 1/2 teaspoon ground cardamom. Stir to mix. Melt the remainder of the stick of butter in a large bowl. Dip each of the biscuit pieces into the melted butter, and arrange in a single layer in the skillet. Sprinkle the sugar mixture over the top of the buttered biscuit pieces, and then squeeze the juice of 1/2 lemon over the whole pan. Bake at 350°F for about 20 minutes or until the biscuits are cooked and just golden. Preheat oven to 400°F. Heat olive oil in cast iron skillet (or other nonstick, oven safe skillet) over medium-high heat. Add red pepper, green onions, green chiles and hash brown potatoes to skillet, and sauté for five minutes or until red pepper is soft. In a medium bowl, whisk eggs, salt, pepper and red pepper flakes. Pour egg mixture over vegetable mixture in cast iron skillet. Sprinkle cheese over the top of the egg mixture. Place frittata into oven, and bake for 12-15 minutes until center set. Broil for one-two minutes to get a bubbly, browned top. Remove from oven and allow to cool for five minutes. 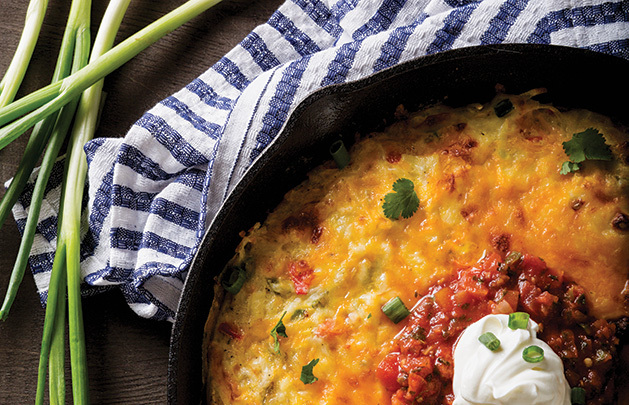 Slice and garnish with cilantro, salsa and sour cream. Preheat the oven to 375°F. Press the pre-made pie crust into a nine-inch pie plate and prick the bottom of the crust with a fork multiple times. Bake the crust for eight minutes. Meanwhile, in a medium-sized bowl, whisk together the eggs, cream and milk, adding pepper to taste. In a sauté pan, heat the olive oil. Sauté the onions until soft, approximately four-five minutes. Add the chopped asparagus, and cook for one more minute. Season with salt and pepper to taste. Stir in the chopped red pepper, and let cool slightly. Remove the pie crust from the oven, and pour in the egg and cream mixture. Stir in the asparagus, onion and red pepper mixture, and distribute evenly. Crumble the goat cheese on top, and grate a fine layer of Parmesan cheese over the top. Bake at 375°F for 35-40 minutes or until just set, and the top is golden in color. Allow to cool, and serve warm or at room temperature.